APEM’s expanding selection of LED indicators shine brilliant and bright to offer high-quality illumination for attractive, functional and innovative designs. 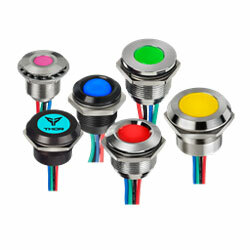 Based on user input, the latest RGB indicators are customizable and offers a vast array of colours and tones. With the mixing of primary colours (red, green and blue), further colours are available such as cyan, magenta, yellow and white, producing the perfect custom colour option for applications. The company’s panel-mounted RGB indicators are claimed to be unique to the global market. Colour animations can be adjusted by the user with the LED lens is available as flush or prominent. Four-wires common anode means these are only accessible in terminal option five. They are offered with 200mm wire termination, and rear epoxy, front panel sealed to IP67.